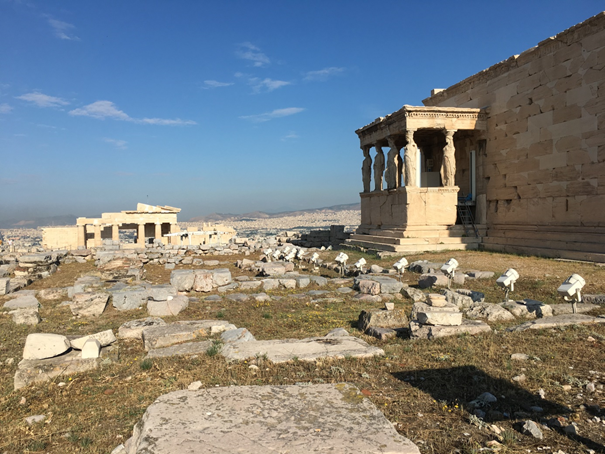 We cast one last glance at the perfection of the Erechteion, took one last walk around the renovated façade of the Parthenon, spotting a cat walking gracefully from one pillar to another. Another cat seemed to have made the place its home and behind him was a lush hill on top of which a ruin was overlooking the whole city. 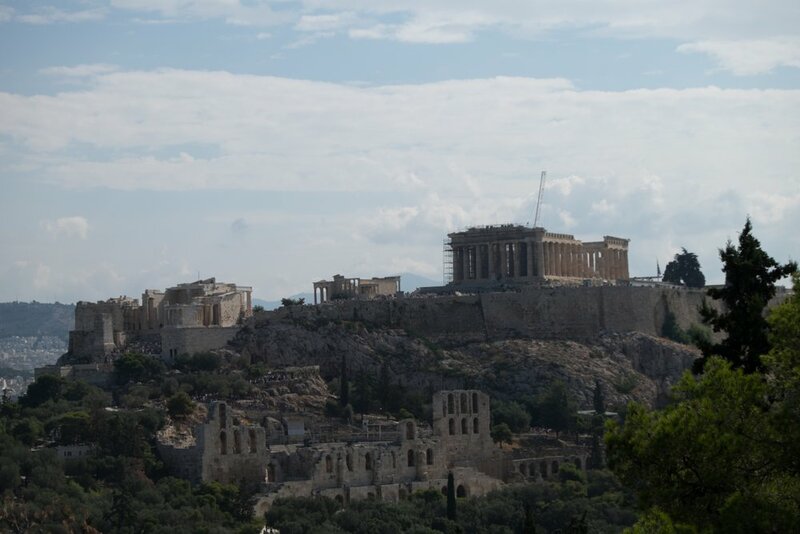 We managed to focus enough to capture the last images we could etch in our memory and turned our back to the Acropolis. Crossing through the Propylae, which had been our gateway to the Acropolis, our eyes widened. Hundreds of people were now queuing in the stairs, unable to walk any further and to progress to the site, blocked by selfie addicts and groups of elders listening to their guide, barring everyone else from moving forward outside of their peers. We couldn’t believe how lucky we had been to have been able to have the Acropolis almost to ourselves. Sure, we had woken up way too early for our own good in order to get to the entrance at the opening hour but it had all been worth it. It took us a few minutes of walking in the opposite direction to the crowd to finally get out of the site. The lush hill we had noticed earlier was nowhere to be seen but our interest had been piqued, enough to start exploring all the different ways we could go up there. A worn-out map helped us get a sense of where we were, pointing to a place called the Filopappou Hill. All it took was to go through the parking lot nearby, which was actually harder than what it sounded like as tons of buses seemed to pop out of nowhere at every turn. Yet, we managed to survive and entered a glade, greeted by a strong smell of pine and an absolute silence. 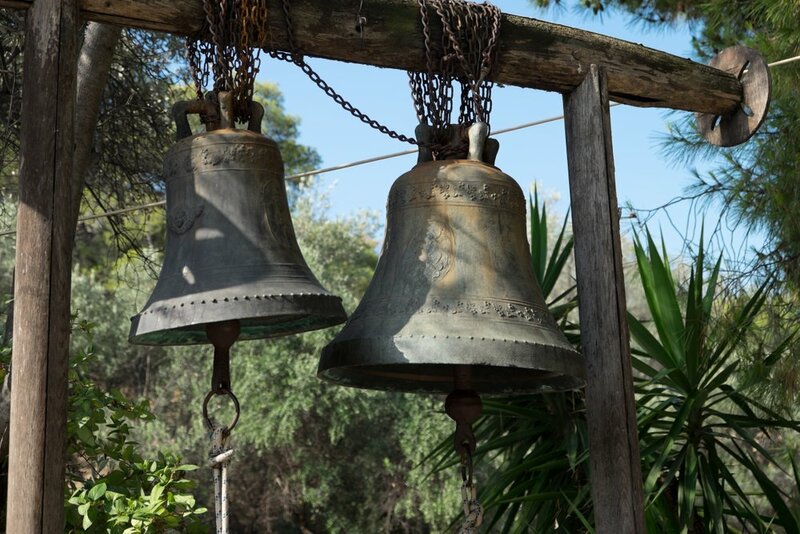 In the distance, we spotted a small, humble wooden church, named the Agios Demetrios Loumpardiaris. The place was so calm and solemn that we did not dare get in, afraid to disturb its peacefulness. Across the main path and away from the holy place was standing a thick, depleted wall which looked like a prison, with rusty bars barring access to it. This most certainly looked like the Prison of Socrates we had heard about, although no proof of Socrates being imprisoned here had been properly found. Still, the name was befitting, conveying a sense of mystery that captured the attention of visitors. Granted, we probably wouldn’t have paid attention to it in the same way had it been solely named the Prison of Filopappou. We started climbing the mound leading to the top of the prison but missed the turn to the jail and ended up higher on the hill, straight to the remnants of the Shrine of the Muses. The crowds were but a distant memory. 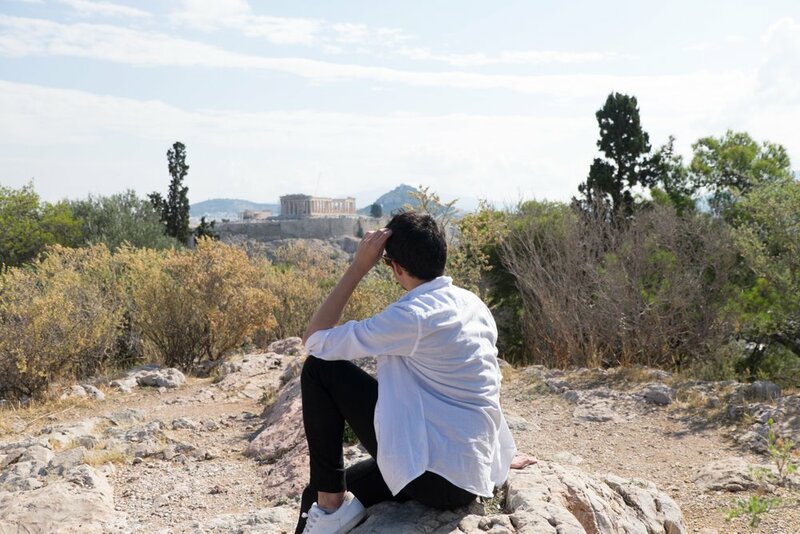 Only a couple chatty pupils passed us by but when they were gone, it was only us, standing in front of the best view of the Acropolis we could ever dream of. Us and an inviting marble ruin in the shape of a bench to enjoy the view to our hearts’ content. No pollution, only the heady smell of pine. No noise, only the wind in our ears. The chill of the morning did not even bother us. It rather came as a relief after the heat we had endured on top of the sun exposed Acropolis. Still, we had some way to go to get to the top of the hill and find out if there could be an even better place ahead, waiting for us. The way up the hill was steep, even though it wasn’t as exhausting as we had feared. We knew we had made it when we saw the broken tip of the Philopappos Monument, looking like a door to nowhere. Or perhaps was it the door to another universe. On one side, the white area of the Piraeus port stretched far into the horizon. 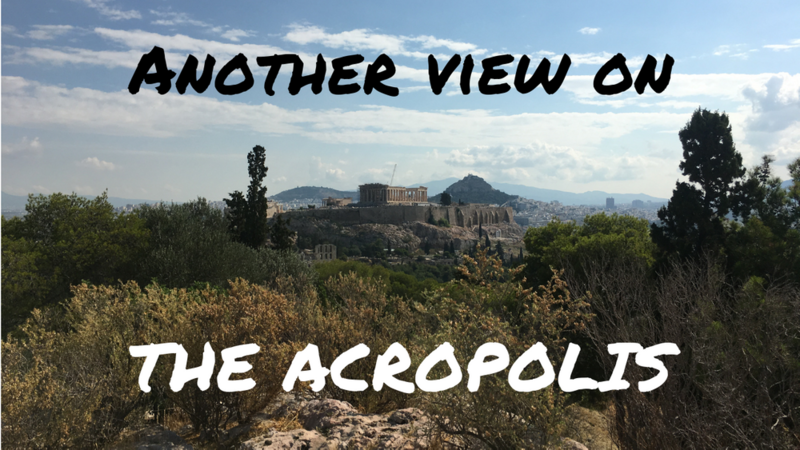 On the other, the view on the Acropolis was even more stupendous than before. We fought against pointy bushes and brambles to get to the edge of the hill, where a couple of visitors were sitting on rocky knolls. The perspective was nothing short of spectacular. We could even enjoy some of the details on the buildings we hadn’t seen before, too busy to get to the Parthenon as fast as we could. In the distance, we could see a long queue of colourful, midget like dots. Yet there we were, only a handful of lucky visitors indulging in a moment that would last for a long time. 5 APP EVERY TRAVELER SHOULD HAVE !